Add a touch of romance to your cake cutting tradition with our Elegant Rose cake knife and server. The traditional flower of love perfectly complements a variety of wedding themes or you can continue the Elegant Rose theme with our other matching reception accessories. 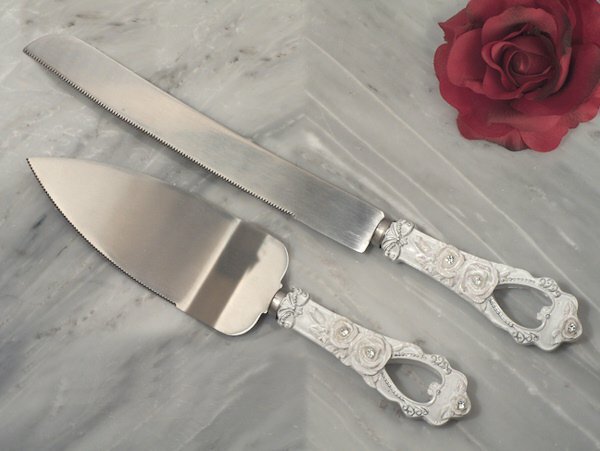 Each sturdy stainless steel cake knife and server features sculpted rose and heart handles. Cake server measures 10" and cake knife measures 12" long. Comes packaged in a display gift box. Hi I am wondering if it is possible to get the Starfish beach Cake and Knife Server set personalized? Hello. Can the cake server set be engraved? I'm sorry, we don't have personalization available for the Elegant Rose Cake Server Set.